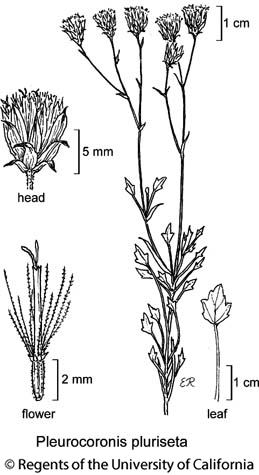 Habit: Perennial herb or subshrub. Leaf: proximally opposite, distally alternate, sometimes in axillary clusters. Inflorescence: heads discoid, 1 or few in cyme-like clusters; phyllaries graduated in 3--5 series, outer short, ovate, inner lanceolate; receptacle +- flat, epaleate. Flower: 25--30; corolla narrowly cylindric, white or purple tinged; anther base +- rounded, tip ovate or oblong; style branches +- 1.5 mm, club-shaped. Fruit: ellipsoid to obconic, 4--5-ribbed; sides densely hairy; pappus of bristles and scales. Habit: Subshrub <= 60 cm. Stem: slender, much-branched, distally glandular. Leaf: thin; petiole thread-like, 20--60 mm, glandular, blade 3--10 mm, lanceolate to +- diamond-shaped, generally few-toothed, glabrous or +- glandular. Inflorescence: heads 6--11 mm; phyllaries +- 25, 2.5--6 mm, glandular, tips darker, generally recurved. Flower: corolla 4--5 mm. Fruit: 3--4 mm; pappus bristles 10--16, 2.5--5 mm, scales 10--12, 1--2 mm. Chromosomes: 2n=18. Citation for this treatment: David J. Keil & A. Michael Powell 2012, Pleurocoronis pluriseta, in Jepson Flora Project (eds.) Jepson eFlora, http://ucjeps.berkeley.edu/eflora/eflora_display.php?tid=4412, accessed on April 24, 2019.